The last time Ottawa decided to make some noise about air passenger rights, in 2000, they brought an ex-NHL referee to a news conference. Bruce Hood, the newly minted air complaints commissioner, pulled out a whistle and blew it. Literally. If you’re looking for the highlight of Ottawa’s past work to improve the passenger experience, that would be about it. Hood packed up his whistle and left town within two years, and the initiative fizzled out a few years later. So, when the Liberal government announced consultations on improving passenger rights in 2016, the history on the file was not encouraging. There had been talk of an airline bill of rights for decades in Ottawa, countless private member’s bills that have gone nowhere, and many consultations. But they have always foundered, as a succession of governments decided for a couple of reasons to leave the airlines alone. Finally, last month, Parliament passed the Transportation Modernization Act, which mandates the Canadian Transportation Agency to develop regulations for airlines’ obligations to air passengers. Those CTA consultations have just begun, and the process will bear close watching. Governments have long been leery of slapping excess regulation on a business that frequently seems to be flirting with the line between profit and loss. One just has to recall the litany of bankruptcies among US, European and Asian carriers. Most countries, Canada included, have also believed in the importance of maintaining at least one flag carrier, an airline to represent the country in other markets. The Canadian Transportation Agency has launched consultations on air passenger rights. The rules around compensating passengers should be clear and firm.The resulting policy stance has meant the Canadian mainline carriers – the ones that serve all the less profitable routes that connect the country – are treated a little like the banks. That means either being expected to maintain a strong network, even during adverse economic conditions, or being protected to the point where competition on price and service suffers. But it must be said that airlines do a good job, most of the time. There are very few businesses that have as many direct dealings with customers – each one a potential opportunity to fumble a reservation, lose a bag, oversell a flight or spill a drink. Given the multiple possibilities of screwing up, it’s a miracle ─ and a tribute to good systems ─ that most of us get where we’re going when we fly, most of the time. And yet, bad things do happen. And when they do, it’s been quite unclear what the average person’s rights are or how to claim them. Under the existing rules, airlines have to file tariffs with the government – legal documents that describe their services, with some sections that deal with passenger compensation rules. However, the airlines are under no obligation to make these documents readily available to passengers and no outside body got to sit in judgment of their overall fairness. When we at the CAA went hunting for one airline’s tariff last year, we eventually found it, buried many layers down on their website, under an obscure heading. It was a PDF of what looked to be a photocopy of a legal document many, many pages long. When we at the CAA went hunting for one airline’s tariff, we eventually found it in 2016, buried many layers down on their website, under an obscure heading. It was a PDF of what looked to be a photocopy of a legal document. It was many, many pages long, blurry and in small type. Good luck retrieving that quickly at the airport counter after a cancelled flight. How is a traveller supposed to know if what they’re being offered by the agent at the counter is fair, or if there is room to bargain? The provisions included in the new Act are a good start at addressing this imbalance between passengers and airlines. Bumping, lengthy tarmac waits, flight delays and cancellations will all be covered. The Act, however, leaves it to the Canadian Transportation Agency through its consultations to fill in the all-important details like how much compensation should be disbursed and under exactly what conditions. Pro-active compensation. Passengers have the right today to complain to the Canada Transportation Agency, but the process can be lengthy. The new system should require the airlines to proactively provide compensation when they break the rules, so that passengers have to complain only if the airlines do not offer compensation. Concise rules around the categories of compensation. For instance, the legislation sets out different levels of care expected if a flight is disrupted for various business reasons (in other words, it is the airline’s responsibility), mechanical problems (it is partly their fault), and weather (stuff happens). Of course, there is a temptation on the part of an airline to lean towards certain reasons over others – a mechanical problem will cost the airlines less. The CTA will need to strengthen its audit capabilities, to ensure the airlines do not have an incentive to cheat. In cases where compensation is due, it should be in cash, not vouchers or upgrades, where the value may not be as clear. The regime, expected to be in place by the beginning of 2019, will at least set out clear standards of treatment, including minimum levels of compensation, in easily accessible language – all mandated in the legislation. It will, in reality, be an airline passenger bill of rights. It has come about as a result of four factors that came together. First, the power of social media, which puts out for all to see the stories of backed-up toilets, passengers being dragged off overbooked flights and guitars being flung around ─ and these are just some of the worst instances of customers’ mistreatment. The second factor is that there has recently been an upswing in carrier profitability. When we at the CAA went hunting for one airline’s tariff last year, we eventually found it, buried many layers down on their website, under an obscure heading. It was a PDF of what looked to be a photocopy of a legal document many, many pages long.Third, the European Union and the United States have in recent years put these regimes in place. This resulted in no discernible hit on earnings, and has left Canada lagging behind. As it stands, it could be cheaper for an airline flying to Canada from Europe, even a Canadian one, to bump someone holding a Canadian passport than to bump someone holding a US or EU passport. Fourth, we have a government and Transport Minister, Marc Garneau, who is looking to make a mark for the middle class. 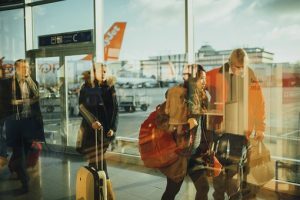 Polling by the CAA has suggested that 91 percent of travellers support an airline code of conduct. Some in Ottawa who are frequent fliers and VIPs may look on this file with bemusement, perhaps because they have status with an airline or perhaps an asterisk beside their name. They would therefore be among the last people in Canada who need to worry about being bumped or treated unfairly. But ordinary Canadians who travel once a year to visit family or to go south are unlikely to know how to use the rules or to be afforded special treatment. The protections in C-49 speak to them. This article is part of the Recalibrating Canada’s Consumer Rights Regime special feature. Ian Jack is managing director of communications and government relations for the Canadian Automobile Association (CAA). He was a Parliament Hill journalist and a political and public service staffer.